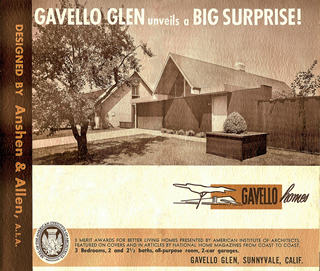 Two panels from a Gavello Homes brochure produced in the late 1950s. 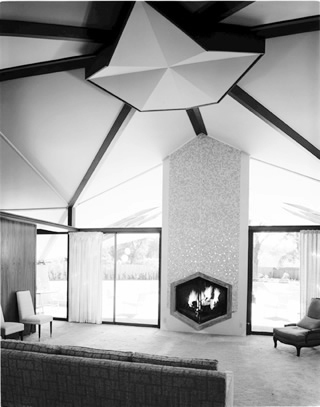 Inside and outside the Gavello Atherton family home, with its star-shaped roof, designed by Anshen and Allen and built in 1960. Gavello Glen was forward thinking in another way, though in a way that never got built. In a 1991 videotaped interview (it's on YouTube) with the Gavello Glen Neighborhood Association, Elmer Gavello revealed that Anshen and Allen proposed to build rows of attached houses in order to avoid wasted space between houses. Row houses are common of course in cities but rare even today in many suburbs, and almost unheard of back in the mid-1950s, especially in the wilds of still-rural Sunnyvale. "The [Federal Housing Administration] and city wouldn't go for it," Gavello said. "We tried and tried. No way." Some of the more traditional homes in the neighborhood were built by other developers, who bought lots from Gavello. House and Home noted, in 1952, that Elmer Gavello was delighted with Anshen and Allen's architecture—but his partner was initially less so. His partner, one of Northern California's first women realtors, had been developing real estate in San Francisco and beyond since the 1910s. "Partner Grace Perego is equally enthusiastic, although she had been slow to warm up at first," said House and Home. "When Bob Anshen insisted on an agreement that she would not make any design changes without his written consent, she 'didn't know whether she was going to like that or not.' But after working with the architects, she was delighted." By the time the steep gable came along, Perego was out of the picture. She'd probably been brought in by Gavello because of her development expertise. The Gavello homes won numerous design awards, including several 'Merit Awards for Better Living Homes' from the American Institute of Architects. Elmer Gavello, who presented himself during the videotaping as an aw-shucks kind of guy, told of accepting the first such award from Frank Lloyd Wright then finding himself tongue-tied when asked to address the gathering. "I said, Hmm...15,000 people! What do you say?" "It wasn't me [who deserved the award]," Gavello told the Gavello Glen neighbors. "It was the architects, the designers." 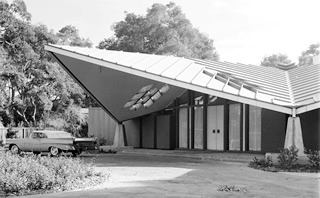 In 1960 Elmer Gavello hired Anshen and Allen to design his family a new home in Atherton—complete with a roof shaped "like a perfect star" that floated above the house and was held in place by steel piers. Each pier rested in a "goldfish pond" that collected rainwater before channeling it into a creek. Each of nine rooms opened to the out-of-doors through sliding glass. 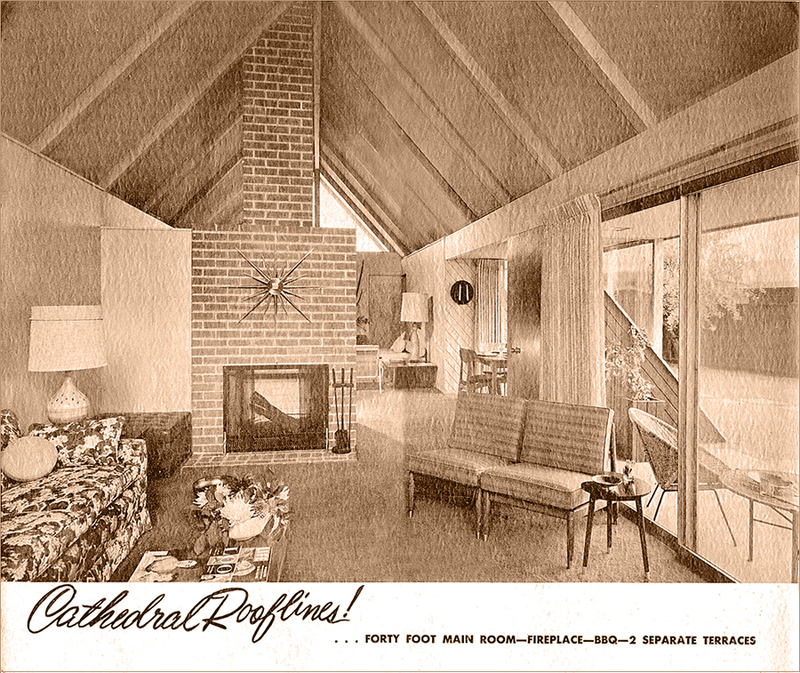 Although ceilings were 16 feet tall, interior walls only rose to eight feet, resulting in what Betty Gavello described to the San Francisco Chronicle in 1961as "an airy feeling." "I like to go way out," Elmer told the Chronicle. "I hate convention." Residents of Gavello Glen who gathered recently to discuss the neighborhood, profess deep fondness for the architecture, citing the openness to the out of doors, the warmth of the redwood, and the ample lots.